The earnest money deposit is very important to a real estate transaction. This is the money a homebuyer pays to the seller when making an offer, to show that the offer is serious. The earnest money can be a few hundred dollars, but is often times 1-2% of the purchase price. 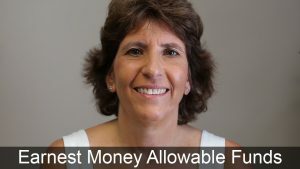 If this video, Mary tells her listeners about the earnest money deposit, and about the sources this money can come from. Just like the money paid for the mortgage deposit and closing costs, the earnest money must come from an allowable source. Hello, I’m Mary Catchur. I’m the owner of Marimark Mortgage. I’ve spoken before about the importance of being able to identify the source of funds that you’re going to use in a real estate transaction. They have to come from allowable sources, such as cash in the bank, or even a gift from a relative. There are sources that cannot be used, such as unsecured funds. What a lot of people don’t realize is that these same rules apply to the earnest money deposit as well. The earnest money deposit is the funds that are put down at the time of signing the contract to show the seller that you’re serious about making this purchase. I’ve seen them vary, anywhere from $500 to over $10,000. And many borrowers don’t realize that they also have to document the source of those funds. Recently, I encountered a situation where the borrower paid with a credit card for this deposit and this is a bit unusual. Typically, charges that are put on a credit card are considered unsecured funds, and this would not be an allowable source of the earnest money deposit. So while it may seem like a good idea to get those extra bonus points on your credit card, it may not be the best source of funds in making a purchase for a home. If you’re interested in hearing more on this topic, please feel free to give us a call at, 866-910-8020, or visit our website, MarimarkMortgage.com. Thank you for all that you did to make this closing go so smoothly. After waiting for 2 months for another lender who kept promising we’d “close soon”, you got the job done in less than 2 weeks and at a better rate. We will definitely refer you to others.